In commemoration of St. Peter and St. Paul today, we are posting an excerpt from Michael Middendorf’s commentary on St. Paul’s Letter to the Romans. Romans 1–8 articulates the meaning of the Greek text of Romans in its original context for the benefit of the church and world today. 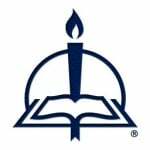 Though a theologically thorough and high level commentary, it is not overly technical and is accessible for lay readers as well as pastors and scholars. Middendorf’s commentary provides insights that will enhance the understanding and effectiveness of those who have the privilege of proclaiming Paul’s most famous letter.
. . . As Paul speaks to the issues that he determined were vital to those in that setting, he repeatedly emphasizes that the Good News of God’s righteousness in Jesus Christ is for all humanity. There is, then, a need to properly balance the situational nature of the letter Paul addressed to a specific first-century context in Rome with the broad sweep of its content, which has universal implications for people of every ethnicity, culture, and time. This is not at all to undermine the differences between Jew and Greek, or between the first century and the twenty-first. Instead, this observation underlines that Romans is primarily “a book about God,” who does not change (Mal 3:6), and God’s perspective is Paul’s primary concern. One main message of Romans is that God does not discriminate. Since there is no partiality with God (Rom 2:11), his Law condemns all people as sinners who deserve his righteous wrath; at the same time, his declaration of righteousness is for all through the faithfulness of and/or our faith in Jesus Christ (3:22–23). This justified relationship with God is not at all about our works or willing or running, but about the God who calls and shows mercy (9:12, 16). “For God has locked up all people [τοὺς πάντας] in disobedience in order that he might have mercy on all [τοὺς πάντας]” (11:32). All in all, Paul uses forms of πᾶς, “every, all,” seventy times in Romans! When pertaining to people, the term is sometimes limited to all in Rome (1:7, 8; 15:33), all Israel (9:6, 7; 10:16; 11:26), all Gentiles (1:5; 16:26), or all the churches (16:4, 16). But, more often, it applies to everyone within a respective context, if one is enunciated at all. Throughout Romans, Paul utilizes the dual description of Jew and Gentile/Greek eight times to encompass everybody as well (1:16; 2:9, 10; 3:9, 29; 9:24; 10:12; 15:8–9). While this terminology allows Paul to speak in an all-inclusive sense, it also provides a key insight into Paul’s purpose in writing Romans. Comparable dual expressions used by Paul elsewhere add other ways to speak of all humanity, namely, as Greeks and barbarians, wise and without understanding, slave or free, and male or female (1:14; Gal 3:28). One great power of the Good News (Rom 1:16) is its ability to overcome any and all such human divisions as it reaches out to every people group and culture. In a sense, one can say the Gospel transcends culture. But this does not mean Christianity is, or ever has been, culture-less. Indeed, it has always been in-culturated. The incarnation of Jesus from the line of David (1:3) and the patriarchs of Israel (9:5) and into a dominantly Jewish culture is the apex of evidence in support of this (see also Mt 1:1–17; 15:24; Lk 1:27; Jn 4:22). For us who are Gentiles, then, Paul was the person most prominently involved in forging our faith’s first great cultural transition. He was the “man who could somehow form a bridge between the Jewish and the Greek worlds.” Along with Paul’s earlier epistle to the Galatians and his later one to the Ephesians, Romans is a critical expression of this initial cultural migration, not only into the lands of Paul’s previous journeys (Rom 15:19), but within Rome itself, and beyond. The Gospel’s universal outreach was declared already by David the psalmist, whom Paul quotes: “their voice went out into all the earth, their words into the ends of the world” (Rom 10:18, quoting Ps 19:4 [MT 19:5]). And so the Word of Christ (Rom 10:17) has gone out for two thousand years, proclaiming that “the same Lord is of all, being rich to all the ones who are calling on him, for ‘everyone who calls on the name of the Lord will be saved’ ” (Rom 10:12–13, quoting Joel 2:32 [MT 3:5]). First and foremost, then, Romans is not about any of us. As discussed above under “Purpose: Debating the Romans Debate,” it is a letter about God’s impartial righteousness, in terms of both wrath and grace (chapters 1–4 and 9–11). This grace is received through faith, through which God grants, and then guides, life in Jesus Christ our Lord (chapters 5–8 and 12–16). This is why the revelation of God’s righteousness is Paul’s Good News for both Jew and Gentile (e.g., 1:1, 9, 16–17; 2:16; 16:25); it is, in fact, the powerful message of salvation for each and every one of us who believes (1:16). Romans is about God reaching out to restore the world and to reconcile us by graciously giving up his only Son for us all so that nothing can separate us from his love (5:8–10; 8:21, 32; 8:39). This is the same God who, as Abraham found out, declares the godless righteous and gives life to the dead (4:1, 5, 17). Most importantly, he raised Jesus from the dead (4:24; 6:4; 8:11) and now calls every heart to believe and every mouth to acknowledge that Jesus is Lord (10:9–10). How, then, will such a God “not also graciously give all things to us together with him?” (8:32). We prepare to enter the text of Romans, then, with the grateful recognition that it is not really about me, you, Luther, Paul, or even the Christians in Rome. Indeed, Paul’s letter turns all of us away from ourselves for a number of salutary reasons. His proclamation of the salvific Good News has another emphasis: from beginning to end, Romans reveals our righteous and gracious God. As the Spirit led Paul, so may he lead us to focus our attention squarely upon God, his righteousness received through faith, and the life together that is in our Lord Jesus Christ. Barclay, The Mind of St. Paul, 11. 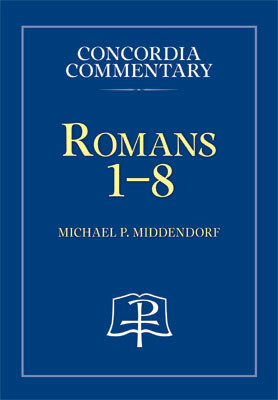 From Concordia Commentary: Romans 1–8, pages 49–51 © 2013 Concordia Publishing House. All rights reserved. 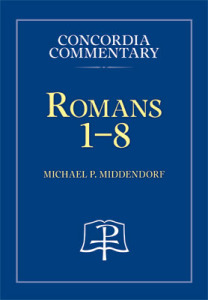 To order Romans 1–8, please contact CPH at 800-325-3040 or visit www.cph.org.